​Over the summer, one of the best-selling titles that went through PolyGram’s independent distribution arm, iD, was In My Kitchen, the debut six-track CDEP by the Tiddas, an all-girl trio from Melbourne. But it barely dented the indy charts because it was selling all over the place, at gigs and truckstops as much as city record stores, independent, mainstream or otherwise. ​This, however, was not a situation that Lou Bennett, Sally Dastey and Amy Saunders were complaining about: the success of In My Kitchen surprised no-one so much as themselves. And if that success has been spread somewhat thin, it’s only symptomatic of a broad appeal which is certainly something the girls wouldn’t want to change. 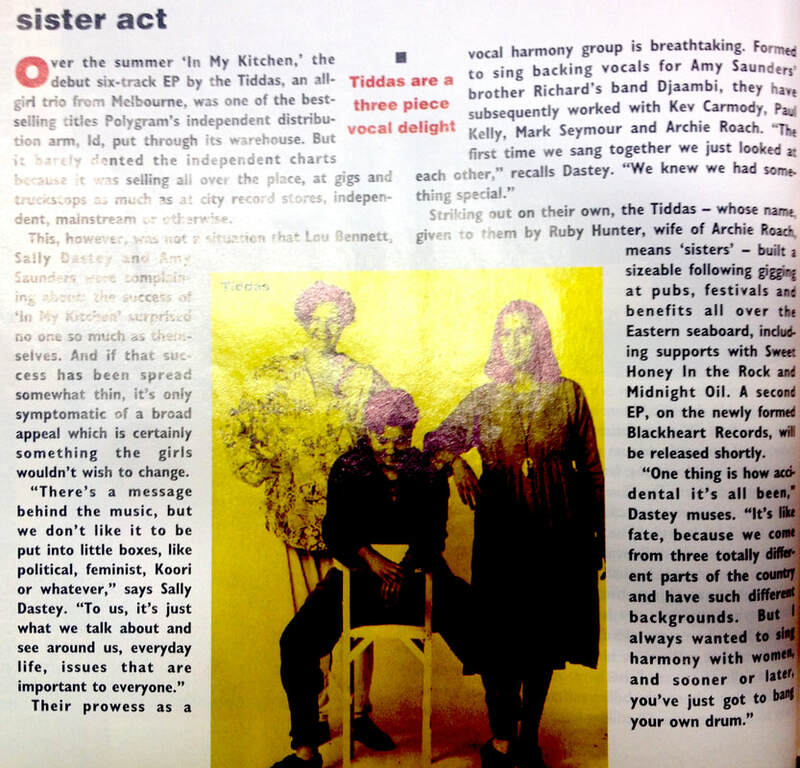 Striking out on their own, the Tiddas – whose name, given to them by Ruby Hunter, means ‘sisters’ – built a sizeable following gigging at pubs, festivals and benefits all over the eastern seaboard, including supports with Sweet Honey in the Rock and Midnight Oil. A second EP, on the newly-formed Blackheart Records, will be released shortly.